When it was announced that the VAR system would be used at the World Cup, there were several raised eyebrows. The system has come under little scrutiny and has had opinions of approval and dissent. A lot of questions questioning the credibility of the system was to be cleared up today in what could have been a refereeing disaster for Sweden, had the decision not to give the penalty stayed. In what could be characterised as the game between the underdogs of group F, we saw the most physical game so far this World Cup, with flying tackles and shoves from either side, accumulating to a grand total of 43 fouls. The game saw Sweden lineup in a 4-4-2, and South Korea in a 4-3-3, with Sweden trying to use the width to get crosses in as Korea set-up defensively. The first half saw Sweden take decent control of the game, and enjoyed more of the ball, but were unable to create clear chances, and flung crosses and long balls into the Korean defence. The first clear chance of the game came in the 20th minute, as the Koreans failed to clear their lines as the ball fell to Berg, who should have buried it, saw the Korean goalkeeper Cho make a heroic save. With both teams rather anxious defensively, the Korean counter-attacks slowly settle into sustained spells of possession play, between the 20th and 30th minute, which Sweden overcame eventually. The latter part of the first half saw both Sweden and Korea threatening to score, with Son being denied a penalty as he went down from a challenge by Augustinsson. Sweden had two opportunities to score in the tail end of the first half, as a lofted pass to Berg at the back post saw him square it in, but no one got to the end of that pass as another good chance went past the Swedes. The Koreans came back stronger in the second half, passed the ball with much more confidence, and played with a lot more purpose, and eventually they did find an opening, as a cross from the left-hand side saw Koo head it to the side netting, which for a second appeared to have beaten the Swedish keeper Olsen at the near post. The Swedes slowly got back into the game, and a terrible challenge from Kim Min-Woo on Claesson saw the penalty being awarded after the intervention of the VAR, with the Salvadorian referee Joel Aguilar denying a penalty at first. 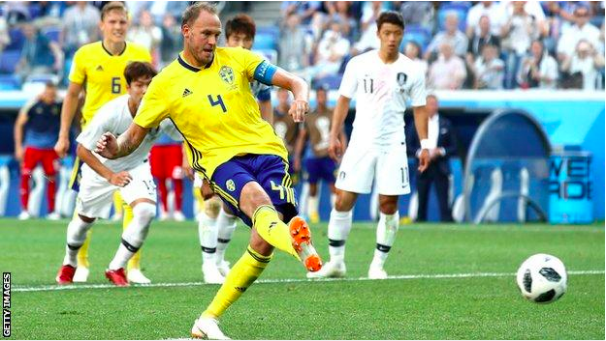 Granqvist continued his near flawless penalty record for club and country, converting from the spot in the 65th minute to hand Sweden the lead. Sweden continued to take control of the game after the goal as it appeared that the Koreans had run out of steam, and sustained their high press and saw almost all of the ball until the 80th minute. After a series of substitutions from either side, the Koreans finally appeared to return for their equaliser as they sustained their attack in the tail end of the game. A golden chance to equalise late came in stoppage time as Hwang had the opportunity to capitalise on a free header, left unmarked on a cross from the left flank saw the ball headed back in from the back post, but he could only divert the header wide as the game reached its conclusion. The game was not easy on the eye and was a very intense physical battle, hence the Swedes will be happy to come out with 3 points in the game and will breathe a huge sigh of relief as they had several opportunities to put the game to bed and could have easily paid for their wastefulness. Germany and Mexico would both be brimming with confidence, as it appears that in terms of quality, the aforementioned teams should progress without any hiccups. To read more match reports from the World Cup, click here. Match report compiled by Sri Vatsal.